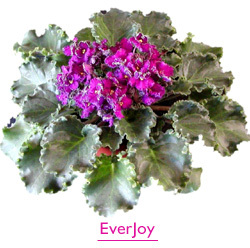 EverFloris is a Series of exclusive varieties developed from the Optimara "Space Violet" program! EverFloris Violets are completely unique! Easier to grow, with larger, fuller blooms that flower continuously. EverFloris Varieties are a direct outcome of the Optimara Space Violet program. The US Space Shuttle Program was retired in 2011, but the legacy lives on in EverFloris Space Violets! The development of EverFloris Violets began in 1984, when 25,000 Optimara seeds were launched into space aboard one of NASA's space shuttles. The seeds remained orbiting the Earth for nearly six years aboard the Long Duration Exposure Facility (LDEF). The Violet seeds were intended to go on a 1 year tour of outer space, this became a 6 year odyssey. The program was conceived to test the effect of long-term exposure to cosmic radiation and lack of gravity for 11 months. Schedules ran late and pushed the satellite retrieval back to 1986. After more delays the LDEF was recovered in January 1990 by Space Shuttle Columbia on mission STS-32. When the seeds were retrieved & germinated, many mutations soon became apparent. One such mutation resulted in a new characteristic which Optimara has dubbed 'multiflorescence.' This characteristic gives Optimara Violets an extraordinary abundance of flowers which never stop blooming. Compared with PMA standards, which define a finished African Violet as having five to seven open blooms, a multiflorescent Optimara variety will have at least 20 open blooms. For a listing and a variety detail of EverFloris violets, click here. Multiflorescence is just one of the remarkable characteristics that make EverFloris Violets so unique. 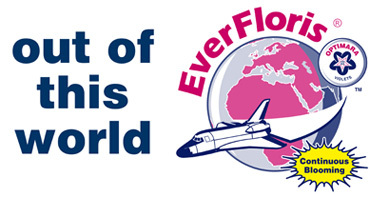 In addition to larger, fuller blooms that flower continuously, EverFloris varieties have been developed to grow bigger. Overall, they are as much as 50 percent bigger. To accommodate their larger growing size, EverFloris Violets are cultivated in a 6-inch pot (instead of the standard 4-inch pot). Like all Optimara Violets, EverFloris varieties are easy to grow. Below is a summary of what you need to know to successfully grow and care for EverFloris Violets. For more detailed care instructions, see Caring for African Violets. Water: Keep soil evenly moist, but never soggy. Use room-temperature water, and avoid splashing water on the leaves. use a self-watering device, such as the Optimara Watermaid. The Optimara Watermaid will provide your EverFloris Violets with the right amount of water for up to two weeks. Fertilizer: Use Optimara Violet Food 14-12-14, each time you water. Optimara Violet Food provides the proper balance of nutrients for optimal flowering and vigorous growth. 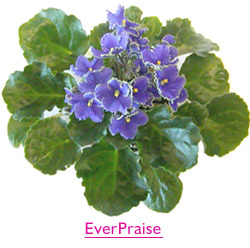 Light: EverFloris Violets, like all African Violets, perform best when they receive plenty of indirect sunlight. This can be achieved with sheer curtains or partially closed blinds. Climate: Keep temperature at 60 to 80 degrees F. Ideal temperature is about 70 degrees. Humidity should be at least 40 to 60 percent. & Exclusive Photos of New Varieties in Development!